With the advent of LEDs bringing cheap, compact and low energy lights to the world at a rapid pace, I have been trying to find uses for them in less than normal applications. 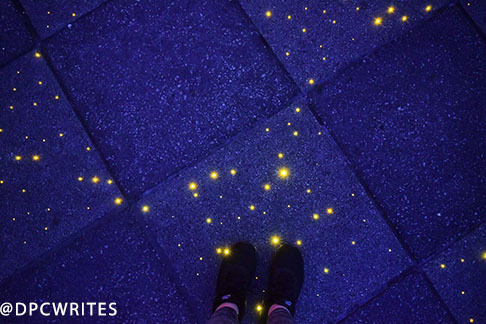 A recent project, inspired by a trip to Epcot center, found an interesting use for LEDs, fiber optics and concrete. I have an old satellite dish pole in the yard. I also have an old boat grill that went in the rod holder. 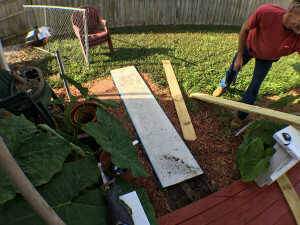 The two fit perfectly but the only trouble was the satellite pole was out in the yard and not on the back deck of course. 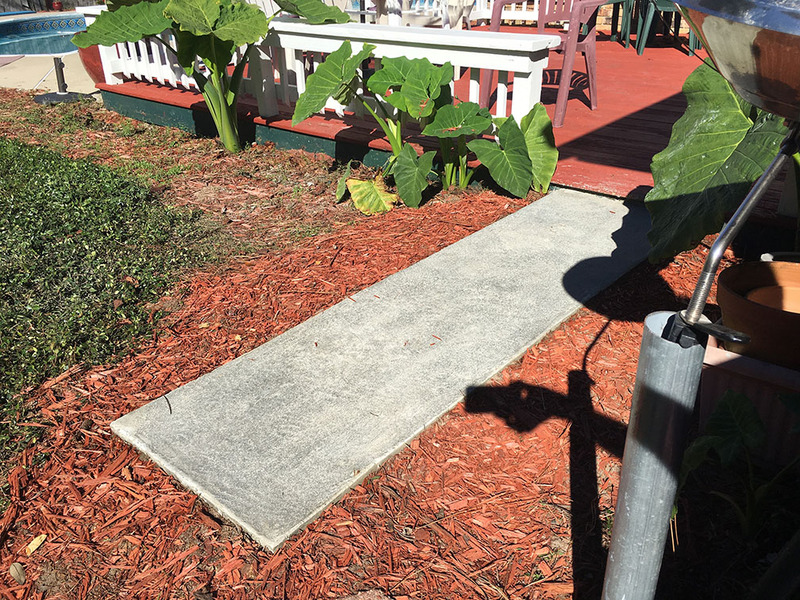 After a summer of using all kinds of things, even a fiberglass diving board that had been removed from the pool, I decided the right thing to do is put in a small concrete pad/sidewalk out to the grill to make things right. The light bulb went off and I decided we would install fiber optic concrete for grins. 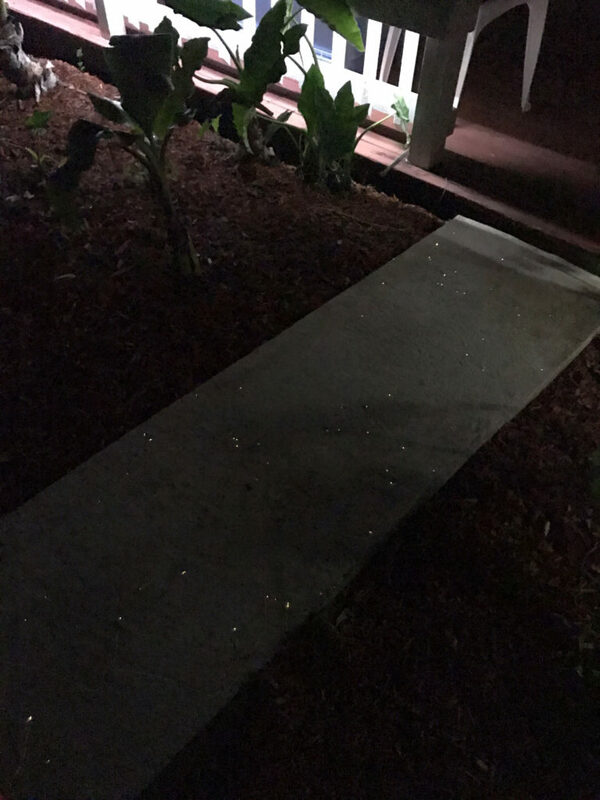 Earlier this summer I had installed LEDs under the railing to the deck, which turned out very nice by the way, so I decided this trend should continue in the concrete such as they do in the concrete at Epcot. This is how we begin. The diving board side walk. 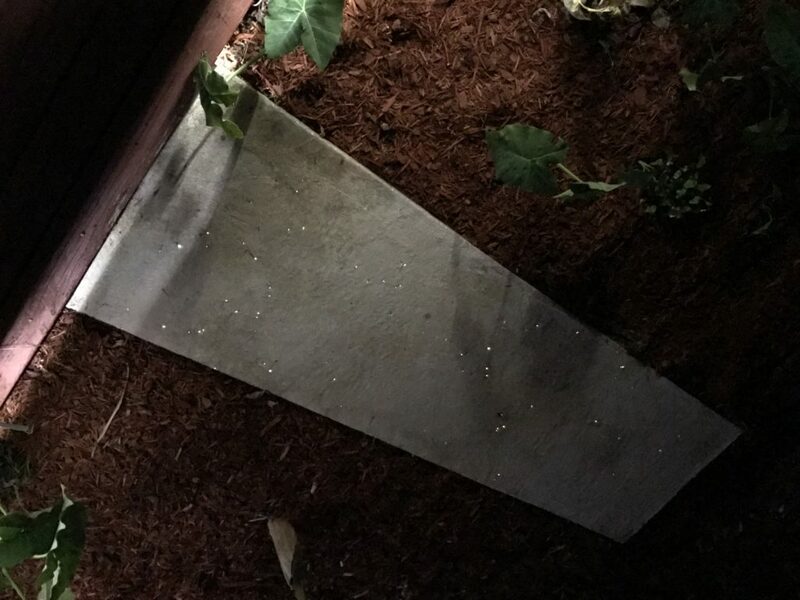 I don’t recommend it, it give off the appearance that we are using garbage for a sidewalk and we were. 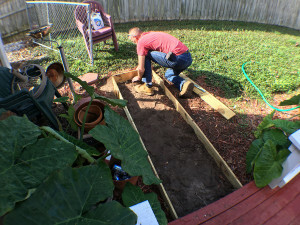 So we took it out and being to build the forms for our fiber optic concrete. 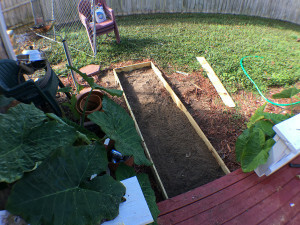 Next step: lay the fiber. Ok so here is where things get tricky. We thought long and hard about this, how do we get the fibers through the concrete? 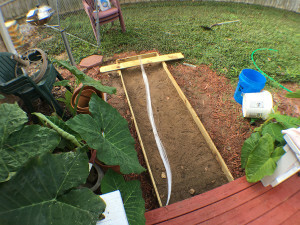 What we came up with is that we should lay the fibers down, then pour the concrete thin and pull them up through it. By the way the base of the fibers are at the back where we will put one little LED that will get its power from the railing, more on that later. Another by the way is we got the fibers from eBay direct from China, about $30 and they took damn near three weeks to arrive but here is a link to some fibers on amazon with hopefully a quicker delivery time for you. 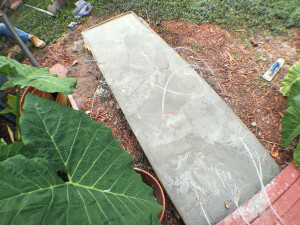 Ok so the concrete didn’t get mixed and poured as thin as we had hoped in the beginning and if you have worked with concrete before you probably know how fast it begins to harden. This causes a problem for our theory but we rolled with it. 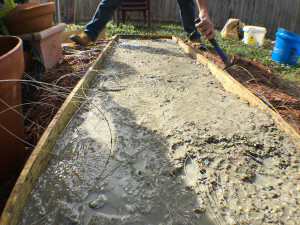 Here goes nothing, concrete begins to pour by one person and the other pulls up the fiber strands to arrange them in a random fashion. The concrete beings to harden instantly and the fibers start tangling as soon and you pull them up. Great. Oh yeah and you need to wear gloves when working with this stuff because the grit is intense and it will take the skin off your finger tips. 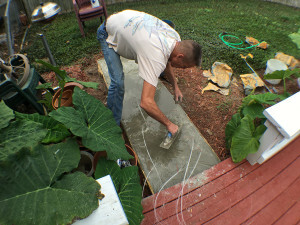 You don’t normally have your hands all in the wet cement. It was painful. So I’m finding and pulling up strands and moving them around, move one they all move. They all want to bunch together, enter zip ties. Those bunches are tied together to keep the up and out of the drying cement. It worked fairly well, the bunches were already together in a fashion of the sections of strands we had pulled apart before pouring. 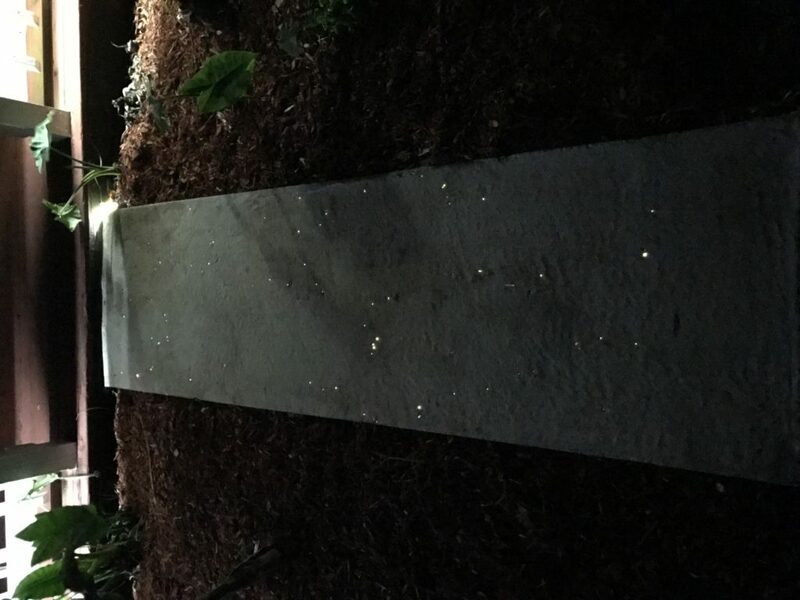 At this point we thought that it totally wasn’t going to work and would look awful but we were too far to stop so we pressed on with out fiber optic concrete project. Lets talk about troweling. 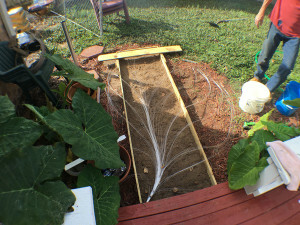 Well how the hell are you supposed to trowel when there are fiber sticking up through it and its drying at a quick pace. Answer, very carefully. We let the concrete cure a little longer and then snipped the fibers about an inch or two above the wet concrete so we could then trowel over the whole surface but at this point the fibers had enough tension from the hardening that after troweling they would pop right back up where they were supposed to be. Now we wait and hope. We let it dry all the way over a couple of days and clipped the fibers flush with the dry cement and placed an LED light source at the base of the fibers, now we wait for nightfall. Holy crap it worked! It may be hard to see in that image but it worked. 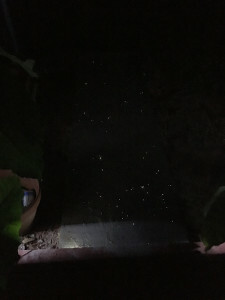 It looks like there are stars in the side walk. Now its not as good as Disney’s. All I can think of is they built theirs in fiber optic concrete molds, especially the animated ones, they would have to, no other way. But it still came out pretty cool and Im more than happy with it. Remember while doing it I thought there was no way we were going to get anything. The fiber bundle I bought contained 200 strands and Im not seeing 200 strands worth of light here so I’m sure there are a lot, maybe half, stuck in the concrete that got tangled and never made it out. Oh well Im glad its not a total failure. 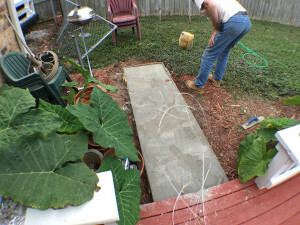 Take a look at the time lapse video of the day we did the concrete work. It was 4.5 hours down to 4.5 minutes. Thanks for reading and if you have a story, tips, advice on how to do this, please write about it in the comments!